What is networked learning? Is it just another round of techno hype? Is it just another name for an older idea? Is it even useful considering the current condition of our schools and colleges? I dunno really. Now that I'm working on the "inside" the view is different and these questions seem more important. From the outside they seemed pointless - networked learning is inevitable when you're on the outside. From the collective inside its a remote idea, let alone possibility, smelling of yet another round of hype, and yet another thing to "do". Apart from Bill's yet-another-excellent post, and exciting link to a book coming out, the device that gnuChris points to for generating a picture of your network is a lot of fun and a bit of an eye opener. Pictured is my network of learning. From this network I have learned more than I could possibly describe in any certificate or qualification... there in lies a problem really... how can we assess learning done in a networked environment? do we? should we? can we? probably not. So networked learning may just be yet another "learning style"? Agreed. The inside / outside relationship is a hard one and sometimes it seems that the "outside" dont see how the inside works particularly considering the the LMS. What I'm interested in is your reference - rather questions of Networked learning .....is it grating on you or are you seriously looking at other nomenclature to better define what you do best ? Touchmap gives us a picture but not the social dividends. As always cool tools are cool. Getting cool tools opened up from the inside seems the greatest challenge as the name of the game in my opinion is to reach and relaise the social dividends from networking knowledge with open word. Cool pics in your Flickr. Hope your having fun there. Ps. Any chance we can get some of your more racy podcasts for the talkingVTE.blogspot.com site? I've been waiting for ages to have a recorded rant and rave for VTE formally CTN. Steph knows I have, what's the delay? As for Networked Learning, its just that so many teachers are so cynical (with good reason too I spose) and new terms representing difficult to demonstrate ideas and new practices can be all too quickly dismissed. But with big D back on the scene (Stephen D) I feel stealed against those cynics and am willing to say that its their problem not mine. Regarding the social capital (there's a largely accepted economic term that could carry more wait into the networked learning discussions), I agree the above picture doesn't capture it, but the working link does in some way, simply by having the chance to click the nodes... what would be better is if each node had a little sample roll over, a bit like Frappr map profiles. That way the real people behind each node (social capital) could be more quickly seen. I have cross posted this follow up to your comments on my blog to this post (which go me started) in case you don’t regularly re-visit other blog’s comments. Leigh, I think my initial difficulties in understanding the concept of Networked Learning stemmed from my interpretation of what a network was. When I first started reading blogs, one of the first posts I read from you was on the topic of Networked Learning. In the first few months of getting into blogging I was pretty wide eyed and everyone I started reading seemed to be an expert (Will Richardson, David Warlick, Steve Dembo) and so I actually thought the NL concept to be beyond my level of understanding. So for a while I didn’t try to go any further - just treated like the word in a story you encounter for the first time. You can skip it and the story still manages to make sense. I just thought in the context of everything else you wrote that NL was a close cousin of online learning and that networked referred to computer networks and the internet. 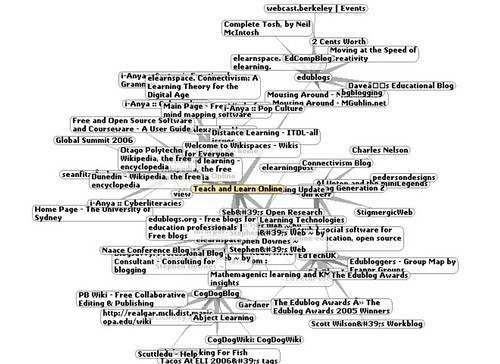 I didn’t really appreciate the concept in terms of a personal learning network until I saw the touchgraph. The learning you referred to I think I confused with content originally because that’s what I started imagining the network being used to access. Looking at the definition now, it seems a lot clearer and maybe what a lot of people do is look for a complex definition for an idea that isn’t that complicated and that anyone accessing anyone else in electonic form is probably involved to some depth in Networked Learning. I have to admit, some of this is my own laziness - I haven’t dug much around to really immerse myself in the concept. So don’t fret (except if you read this and think, oh no, he really doesn’t have a clue!!) your concept is clear, the touch graph adds a new dimension of illustrating it but as Alex Hayes points out in your comments, a visual representation cannot show the varying depth behind all of the networked links - the fact that I might get a lot more in terms of learning from a Doug Noon or an Artichoke with deep, thought provoking insight that makes me re-examine what I do to a shallower source (I won’t name one here!) where I might just find out about a new online app or a new service or what happened in a podcast get together. Hope this helps in your understanding of how my brain grappled with Networked Learning. In response to your question: "... how can we assess learning done in a networked environment?" Maybe it's in the 'formative' rather than 'summative' assessment that the true benefits of networked learning lie. The journey is important and not just the artifact at the end, so perhaps students can be assessed on the reflections of their journeys, with clear criteria set. I suspect that this issue also comes up in workplaces and not just academic environments - with the pressure to 'measure' and track the value of networked learning as part of 'performance management systems' in organisations? Assessment of learning in the workplace is not something I come across Maall that often Margot, but yes I'm sure its just as hard to measure. Recently I put together one of those Academic Evidence Portfolios as per the organisations system, and just felt like I was double handleing so much! Taking away from where that portfolio naturally sits in all its rish dimension, and placing it within the very one dimensional view in the system. In the end all I felt like putting in there was "google=leigh blackall" - nuff said? Formative assessment it would be, with the summative perhaps being the stats you can find in blog stats, technorati, bloglines subscribers and del.icio.us counts. Networked learning is something that everyone who speaks the words, Web 2.0, will assume that you understand but has no succinct way to describe when asked. You have taken on an admirable task to try to define. I look forward to your work. Are you defining Networked Learning as the equivilent of Networked Collaborative Learning? Yes, I am a Leigh too. There aren't too many of us around but we are quality people, eh Leigh? A definition is still evolving on Wikipedia - and so yes, collaboration is certainly a dimension to networked learning. Hope you'll come on over and help us work on it.